after i booked my tickets to sri lanka i put out a call to friends on facebook for recommendations in the places i was visiting. 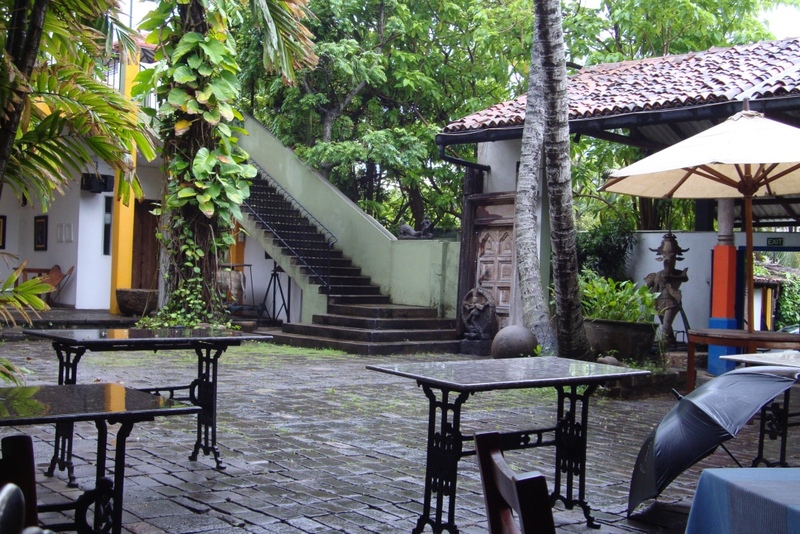 one of the suggestions – barefoot garden cafe – came from priyanka, and upon closer examination i realized it was only about 500m from colombo courtyard, the hotel where i was staying. it sounded like a peaceful and relaxing place, so i knew it would be right up my alley. on my first day in the country, after a long week of work and a late-night arrival, i knew i wanted to do something low-key. something that got me out of my hotel but didn’t require a lot of planning or energy on my part. and that something was a visit to barefoot. i went in search of a cafe, but from the direction of the hotel i ended up entering through the shop. as soon as i walked in i saw linens and tablecloths and pillow covers in all sizes and colours, and i immediately wanted them all. as i explored further inside, i discovered greeting cards and books, beautiful ceramic plates and bowls, hand-crafted and painted animals, and cloth bags of all sorts. in other words, i was pretty much in heaven. i am not a shopper, but places like this are my kryptonite. i took note of what all was on offer, knowing that i would return at the end of the week to pick up some gifts before heading back to bangalore. i was there to eat, so i made my way out the back and into the courtyard. 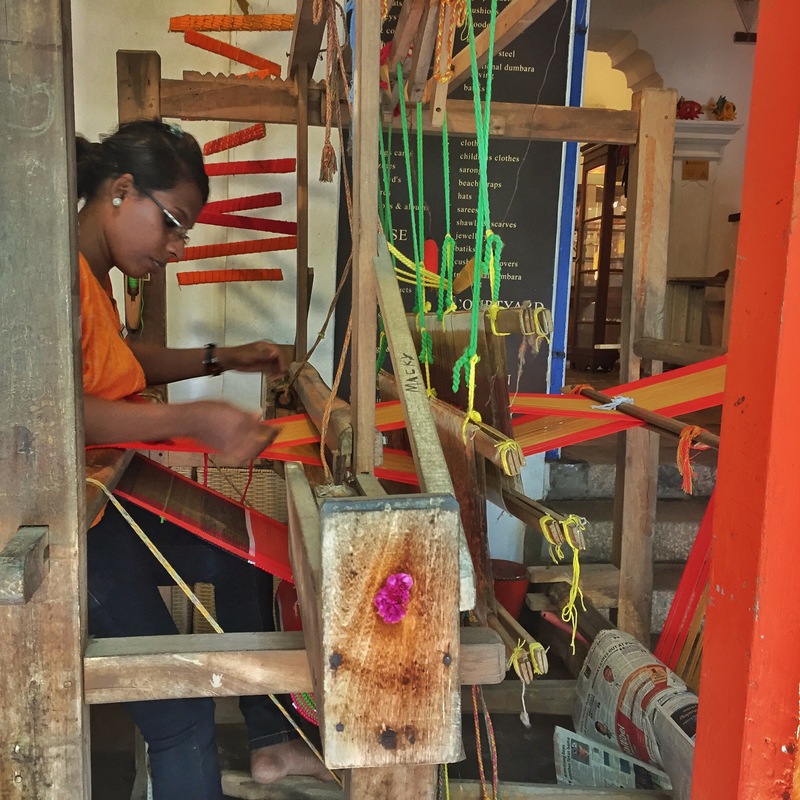 i was struck first by the loom right outside the door, and i stood for a solid five minutes watching one of the shop workers weaving what appeared to be a table mat. i love watching artisans in action, and i was mesmerized seeing the design come to life in front of me. i finally tore myself away and walked toward the cafe, snagging a table with a view of the courtyard and settling in with my book. i opted for a ham and cheese sandwich on ciabatta bread and then had a great chat with my server, who welcomed me to his country and spent a good bit of time recommending restaurants in the area for authentic sri lankan cuisine. 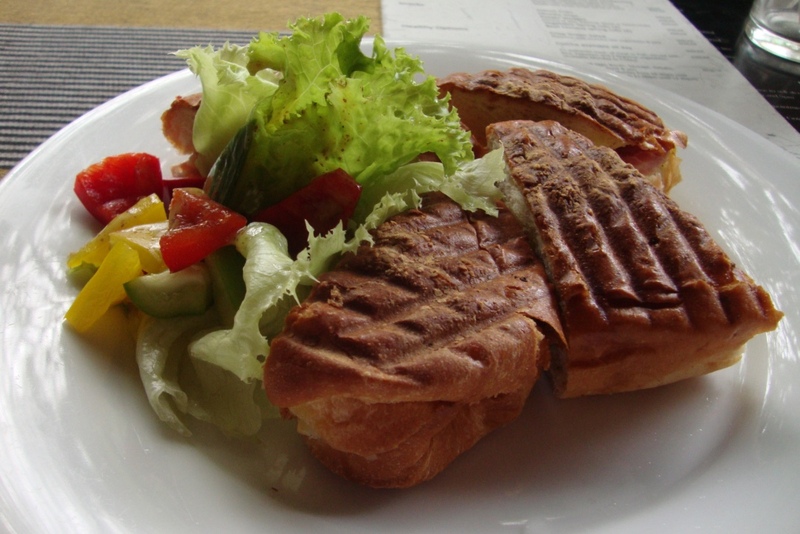 delicious ham and cheese sandwich. colombo, sri lanka. september 2015.
my sandwich was amazing, and i decided to wash it down with a chocolate milkshake. not only was the milkshake so refreshing and delicious, but it was served with not one but two bendy straws. my day was made. 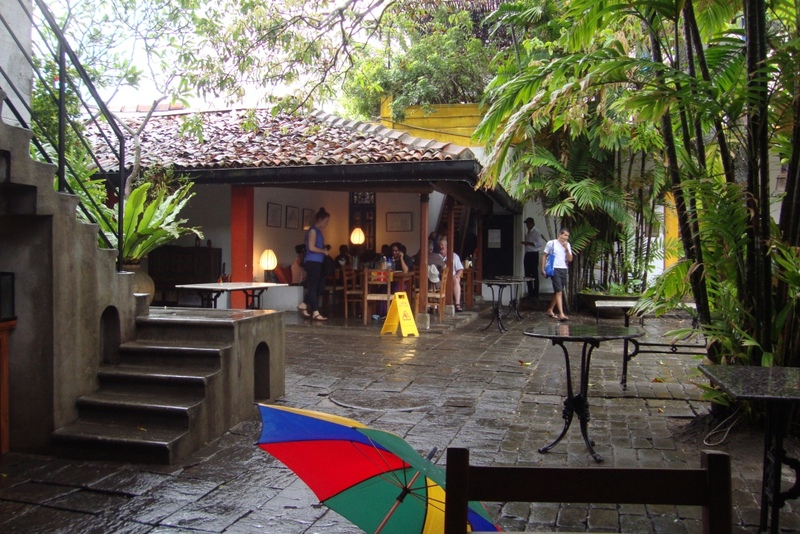 as it was late afternoon – and it had been raining all day long – the cafe was not at all crowded, so i was able to sit and read for as long as i liked. my server checked on me from time-to-time, as did the chef once the kitchen closed, and i enjoyed a very pleasant afternoon and evening in barefoot’s courtyard cafe. i returned the following friday to visit the cafe again and to pick up a few souvenirs for myself and gifts for my parents, brother, and all my favourite babies. it was earlier in the day than my previous visit but was still not very crowded, so again i could enjoy the view. this time i went with the pork loin sandwich and another chocolate milkshake [i wasn’t going to, but it was too good to pass up]. once i had my fill, i headed into the shop to spend all my money. i picked up some coasters, a ton of stuffed elephants and fish for the kids, a few pillow covers, way too many postcards, and a few keychains and magnets. like i said before: kryptonite. the gifts i have distributed thus far have been solid successes, and i’m looking forward to taking the rest back to their recipients in the states. beautiful courtyard at barefoot. colombo, sri lanka. september 2015.
i guess it’s pretty safe to say that priyanka made the recommendation of the trip as far as i’m concerned. barefoot was absolutely the perfect place for me: a lovely cafe where i could relax and read, and a shop with all the things i love to buy. i’m so happy that it worked out for me to visit twice, and i will definitely be recommending it to any of my friends or family who are heading to colombo. location: 704, galle road. colombo – 3. sri lanka. my food recommendation: pork loin sandwich on ciabatta bread; chocolate milkshake. best place to purchase: postcards; keychains; colourful stuffed animals; souvenirs and trinkets of all shapes, sizes, and colours. 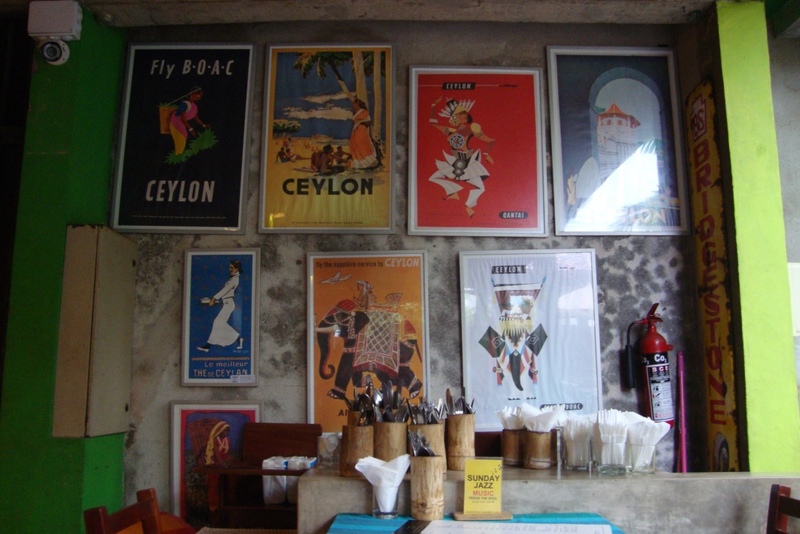 fun fact: they have another colombo location inside the dutch hospital area [closer to the 5-star hotels], and there is a third one inside the galle fort, but those do not have a cafe. Oh that courtyard looks lovely – I’m sure I could spend hours in a place like that, just chilling out! It was absolutely perfect. Definitely a place to check out next time you head to Colombo! weekly roundup 36 // 2015.